Pond treatments are a critical part of keeping your water feature looking its very best. There are a huge variety of pond treatments on the market, some making quite miraculous claims, but we have found that keeping things simple and as natural as possible will produce the best results. Patience is key; water features take time to balance yet we hear from quite a few customers who start dumping in a multitude of pond treatments looking for a “quick fix.” This can result in the entire system needing to be drained and the whole process begun again from the beginning. Different pond treatments are used to help beautify different types of water features. We break water features down into two types, Ecosystem Ponds or other water features that do not contain fish or aquatic plants such as Pondless® Waterfalls and Garden Fountains. The first step in having a healthy, well-balanced Ecosystem Pond is having proper filtration. No amount of pond treatments will make up for inadequate filtration. The two types of pond treatments that are normally used in an Ecosystem Pond are beneficial bacteria and a treatment to control string algae. 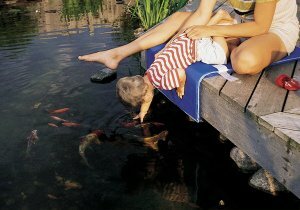 This is all that is necessary to be able to enjoy a clean, clear, healthy pond. Pondless® Waterfalls and Garden Fountains may require less pond treatments and can normally be maintained using just an algaecide. Beneficial Bacteria Beneficial bacteria occurs naturally in the rocks, gravel and biological filter of the Ecosystem Pond but needs to be supplemented weekly to maintain crystal clear water. Beneficial bacteria comes in many forms including dry, liquid, sludge cleaner, bubble tabs and a cold water formula. String Algae Control A small amount of string algae is natural even in a well balanced Ecosystem Pond but it can be minimized by using the proper pond treatment weekly. The most common string algae control products are liquid barley, S.A.B.™ or an algaecide. Certain algaecides are not harmful to fish and can be used in an Ecosystem Pond but only in the proper application rates. The newest string algae control method is the IonGen™ electronic clarifier which is also safe for use with fish and aquatic plants. Dechlorinator / Detoxifier Dechlorinator is used to protect fish and remove the chlorine and chloroamines present in city water supplies. This product should be added during pond start-up or if you are doing a major water change. Detoxifier has the additional benefits of neutralizing ammonia, detoxifying heavy metals, protecting the slime coat on fish and also includes Valerian to relax pond fish during transport. Algaecide Algaecides can be useful in controlling all forms of algae in water features. It is vitally important that algaecides are applied using the proper methods and treatment rates. Some algaecides are not compatible with fish or aquatic plants so be sure to read the instructions before adding any algaecide to an Ecosystem Pond. Algaecides come in both dry and liquid forms. Flocculent Flocculents are designed to clear cloudy or discolored water by clumping suspended debris together. Proper dosage is critical, using too much flocculent can actually cause the debris particles to repel each other and make the water quality even worse. Pond Tint Pond tints are a non-toxic dye that color the water and therefore reduce the effects of sunlight and the growth of algae. Foam Remover Excess foam may occur after a heavy rainstorm or due to fast moving water in a pond. Foam remover eliminates this problem quickly and easily. True Pump carries only the highest quality pond treatments from the top manufacturers. If you’re unsure of which treatment is right for you just call or email us today.